"The collaboration with Scottish Autism during the last few years has been extremely beneficial for us in Aarhus. We share knowledge of the development of ATLASS as a staff training model and philosophy. Scottish Autism has been tremendously generous in sharing knowledge especially of their Right Click programme – thanks to which we have now built our own e- learning programme. We feel a strong connection and friendship to the organisation and the people we collaborate with." Scottish Autism is dedicated to enriching the lives of people with autism. We are the largest provider of autism-specific services in Scotland offering a wide range of support including education, day and vocational opportunities, supported living, outreach, respite and a specialist transition service. Sharing our knowledge and experience with parents and professionals is also a key part of our approach. We do this through our dedicated team of Autism Advisors who are on hand to provide emotional and practical support via our advice line and our online support programme for parents and carers. In addition, our Centre for Practice Innovation provides an opportunity to bring together research and practice development initiatives and acts as a focal point for relationships with our peers and colleagues in the wider research world. We are committed to providing the best possible services for people with autism. Our organisational quality improvement is driven by the European Foundation for Quality Management (EFQM) which enables us to conduct regular comprehensive reviews of our activities and to identify areas for improvement. To influence and inform the development of autism practice. Jasmine Miller attended the first LIFE conference – Lapland International Forum for Education – in Finland. Three Board members left the organisation in the year: Iain MacPhail, Susan Clark and Kenneth Wardrop. We thank them all for their contribution to Scottish Autism’s development. We will shortly be recruiting once more to return the Board to full strength. The record this year shows substantial progress made towards our goals and I commend this annual review to all our stakeholders. The last year has seen major changes within our organisation. Our pension provision has been reformed and the programme of enterprise architecture which we called 'Fit for the Journey' has generated efficiencies in rota planning and the reduction of administrative tasks. It has brought us to the point of purchasing an entirely new IT system which will yield further gains in productivity and in the understanding of our business processes. Our Centre for Practice Innovation provides a focus for practitioners, researchers and organisations to collaborate, share knowledge and shape innovative autism practice. In addition to our bi-annual magazine Share, a number of papers were accepted by academic journals. Last April we launched Right Click for women and girls. However perhaps the most significant piece of work was the Service User Experience Survey, which is a truly innovative attempt to consult service users with limited verbal skills. 'Action on Autism Research in Scotland' was an advanced multidisciplinary, multi-agency research series partly funded by Scottish Autism. The report published towards the end of 2016 makes recommendations which we hope will lead to more applied research in Scotland, as well as further socio-economic studies which will illuminate meaningful strategies for government in funding services for people with autism. As always in conclusion, I would like to express my sincere thanks to all our staff for their hard work and dedication in continuing to move the organisation forward in the quality of the services it provides, supporting and enabling people living with autism in Scotland. they may experience. Our services are delivered by dedicated teams of practitioners who receive regular autism-specific training. They have the knowledge and skills to maximise the independence and social confidence of every individual. Our grades compare favourably with generic care providers and we continue to achieve the highest overall mean grades in our care inspections in comparison to two other national autism-specific service providers, corroborating the success of our approach. 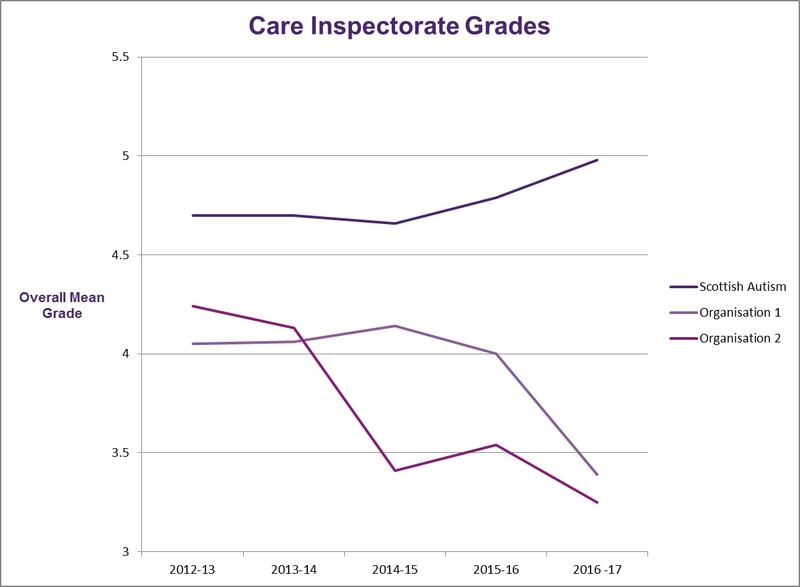 This last year has seen further widening of the gap with 83.4% of all of our care inspection grades at 5 or 6 compared with organisation 1 at 37.8% and organisation 2 at 6.3%. It is vitally important that we develop and embed a shared understanding and a common vocabulary linked to our mission, vision, values and practice across the organisation. We need this, to not only ensure we can enrich the lives of the people we support but to communicate our philosophy and operating model to commissioners and the wider autism community. Our ethical framework for practice underpins our work and reflects what we consider to be at the heart of good autism practice. We are working to develop the application of the framework to all practice related decisions and to guide wider strategic initiatives. Our wellbeing, stress reduction approach to practice is heavily influenced by Studio 3’s ATLASS programme. The focus on positive living and support is a perfect fit for our philosophy and enables us to think differently about behaviour that we find challenging. A number of staff have been trained to Masterclass level and are supporting and enabling colleagues to embed practice across the organisation. As an organisation we have had a sustained focus on Knowledge Management. Our Autism Practice Improvement Framework (APIF) is not only driving practice improvement and development but also knowledge exchange and organisational learning. Based on European Foundation for Quality Management (EFQM) methodology, APIF blends improvement science with our organisational indicators of good autism practice. The development of autism practice improvement projects by APIF teams have fed into a growing body of work that has been created in a ‘by staff for staff’ style. Resources providing best practice guidance relating to changeovers, task breakdowns, autism profiling and review outcomes have been developed and shared throughout staff teams. APIF teams have facilitated and led knowledge sharing events focusing on topics chosen by staff. Staff utilise Source, Scottish Autism’s intranet to share and promote their improvement projects. Staff from numerous APIF teams facilitated engaging workshops at the staff conference in February 2017 to further disseminate their progress and project updates. In the coming year VIP will be supported by the re-design of our e-learning platform that will include a 'VIP Academy' where staff can work through autism training at a range of levels in order to broaden and deepen theoretical knowledge and its application to practice. As has become our practice we will continue to harvest our learning to create knowledge assets for our use and for wider dissemination in order to contribute to resources developed from practice based evidence and experience. Since the inception of our research programme in 2013, Scottish Autism has argued the case that inclusive support practice and inclusive research practice can usefully inform one another. Our practitioner research project on Voice and Participation in Autism Services has focused attention on ways in which supported people can have a say in how their services are run. During the project, practitioner researchers have worked together with autistic people and their families to undertake case studies of effective, enabling practice in this area. Examples of the team’s work include using visual media to participate in review meetings; the use of tablet apps for choice-making; and the development of service user forums and newsletters. In particular we have sought to find ways of including those who do not communicate verbally in ways that are meaningful to those people. In documenting initiatives to better include autistic people in decisions about their lives we have had an opportunity to develop research processes that are themselves more inclusive and participatory than is common in the field of autism: supported people have directed and taken ownership of their case studies, and participants have co-authored presentations and posters at conferences and Knowledge-Share events. The research will be published in autumn 2017 in the journal Good Autism Practice and in the annual Autism and Intellectual Disability in Adults published by Pavillion Press. We will also be publishing an evidence-informed guide to voice and participation for the use of practitioners. In this way we hope that the experiences and lessons from our research can inform the work of colleagues in our field outside of our own organisation. The work has gained increasing recognition in the field of autism practice and research. This year the research team participated again in the Shaping Autism Research seminars. These UK-wide seminars have sought to develop better partnership working between the autistic community, professional researchers, and practitioners. During the course of the seminars Scottish Autism was invited to present our work on practitioner research and our inclusive survey of service user experience. We have also contributed to outputs from the series that highlight best practice in participatory autism research and can be found at www.shapingautismresearch.co.uk/. The year has also seen other projects from our research programme published in peer-reviewed academic journals. In the Spring of 2017 the results of our project on improving vision awareness in autism services, undertaken with Royal National Institute for Blind People Scotland and Edinburgh Napier University, was published in the Journal of Applied Research in Intellectual Disability. At the same time a systematic review of research evidence on the relationships between autism and visual impairment appeared in the Review Journal of Autism and Developmental Disorders. The review highlighted the fact that many outward presentations of autism in childhood can also be indicators of visual impairment. There is a real need, therefore, to improve awareness of sight loss among autism practitioners who may simply put someone’s presentation down to autism. Our own project showed that improving vision awareness among practitioners can lead to improved access to optometry, better service environments and changes to practice supporting people with autism and sight loss. The case for practical research, grounded in the day-to-day experience of autistic people and their families, generated from everyday support practice, and informing changes to the way that we deliver services is gaining increasing recognition within the wider autism community. As we begin our next wave of practice projects we seek to better understand the dynamics of autism services and the ways in which we can better provide enabling support practice. A drive for continuous improvement is embedded in the culture at Scottish Autism as we strive for excellence both as an employer and in the services we provide to autistic people across Scotland. During March 2017 we began changing our organisational quality framework from the Public Service Improvement Framework (PSIF) to The European Foundation for Quality Management (EFQM). The EFQM excellence model is an overarching quality framework recognised across the world as a leading quality model to help organisations measure where they are on their path towards excellence, understand the gaps, stimulate new ideas and drive forward their areas for improvements. All Scottish local authorities recognise and understand EFQM. We also use the Autism Practice Improvement Framework (APIF). APIF uses the same methodology as EFQM and it is widely used across Scottish Autism to assess our practice. Both EFQM & APIF link directly into our knowledge management philosophy. Our drive for continuous improvement has been a real focus for the organisation and we have taken on board the Recognised for Excellence 2015 feedback report to enable us to move forward. The report highlighted many key strengths and also areas for improvement which we have been working hard to address. During January 2017 we decided to apply again for the Recognised for Excellence Award via Quality Scotland in the hope we could improve on our existing 3 star status. To enable us to apply for the award we were again required to complete a detailed submission document which captured all of Scottish Autism’s activities and key results. To allow us to do this effectively many staff at all levels across the organisation were involved in the completion of the document and strict timelines were adhered to. During March 2017 a team of six assessors from a variety of business backgrounds visited Scottish Autism for five days to scrutinise the submission document. This included site visits to many of our services. The assessors spoke with almost 100 people including Board members, the Senior Management Team, Regional Managers, Service Managers, Senior Autism Practitioners, staff focus groups and service users. The results are due Summer 2017 and will outline our key strengths and where we need to improve which will help us drive ourselves forward and to maintain a culture of continuous improvement. The first cohort is drawing to a close with the last few remaining candidates approaching certification. Many would describe this as a journey which has impacted positively on their training practice in a way they never expected. The themes and feedback remain consistent with the focus of development being around learning outcomes and evaluation. In relation to theoretical knowledge, this centred around the impact of adult learning theories on training practice and delivery. We have had two external visits from the SQA over the past 12 months to review the quality of our programme in relation to systems and processes and delivery of the programme. These visits highlighted good practice and supported the organisation to retain centre status for delivery of SQA registered awards. We are in the early planning stages of the second role out of the programme and hope to be delivering the induction by the end of 2017/early 2018. At this stage, we are reflecting on the pilot and considering the changes we would like to make to enhance the delivery of the second programme. Our annual staff conference provided a rich source of learning and development with workshops on topics such as stress reduction, autism and the environment and autism and ADHD. This year we were delighted to welcome Debi Brown who gave her Personal Perspective on Wellbeing. Our internal learning and development team offer continuous professional development opportunities to all staff across the organisation. Covering areas from autism related training to HR related topics, our Learning and Development Business Partners support local services to identify needs and deliver an effective programme to meet a range of requests. As well as developing our own internal training, we work in partnership with other organisations to ensure the appropriate subject experts are involved. With a focus on continuing to offer new opportunities, June 2016 saw a number of managers from various locations complete Scotland’s Mental Health First Aid training, ‘train the trainer’ course which was then added to our training calendar and offered to all employees. In October, 16 staff attended Inclusive Communication training which was delivered by Forth Valley Speech and Language Therapists. We continued our partnership working with Roynal National Institue of Blind People (RNIB) Scotland to offer vision awareness and champion training to staff in various locations after the success of previous training. In conjunction with the NHS, training and guidance for staff to support individuals with Relationships and Sexuality was developed and approved through our internal learning and development sub group quality assurance process. Scottish Autism’s SQA Approved Centre reviewed Policy and Procedures for the delivery of awards and satisfied all criteria for management and delivery during external audits from the SQA. We also worked in partnership with Fife College to offer qualifications which enable staff to meet SSSC registration requirements. Between April 2016 and March 2017, 111 staff from across the organisation have been supported to undertake their HNC, SVQ Level 3 and Level 4. 421 parents and carers accessed our Child, Teen and Adult online support programmes. In July 2016 we launched our Women and Girls programme which has been accessed by 512 individuals, professionals and parents. On Facebook we had 5587 new likes. On Twitter we attracted 1250 new followers. There were 208, 418 visits to our website. 932 people signed-up to receive our monthly e-news. Carried out 50 assessments through the diagnostic service. Delivered 6 Introduction to Autism training courses. Responded to over 1900 enquiries to the advice line. Our day opportunities offer diverse experiences for individuals with autism. Individuals are supported by practitioners who take the time to understand their needs and focus on enabling them to enjoy new experiences. Fife Outreach Art Group takes place every fortnight at our Woodend Day Service in Cowdenbeath. The group is service user led and when an idea is voiced and the group are in favour of it, then they will give it a try. They started out making arts and crafts in celebration of the most well-known dates in the calendar: Easter, Christmas, Mother’s Day and Father’s Day. However the group felt that in order to keep motivation levels high, it was better to have a different project for each evening rather than working on one activity over a number of sessions. Other group developments have included celebrating more dates in the calendar, outings to art related events and holding Macmillan coffee mornings. It has naturally evolved that the sessions have become a social get together rather than solely a craft night. The sessions support new friendships to be formed and old friendships to be rekindled. The next project that the group are working on together is to create a display of their artwork for friends and family to enjoy. Being part of a group can be beneficial for a person in a number of ways as one of our practitioners explains: “Mark is given a choice to come to the group and he always responds ‘yes!’. He enjoys seeing people he doesn’t see very often, both staff and service users. He gets a lot of interaction and communication opportunities and has grown more confident within the group in the time he has been attending. He has surprised us with his art skills and it has given him more opportunity to do activities independently. The group can sometimes be quite large but he loves to people watch and there is always the opportunity to go to a quieter room. I believe the secret to the group is its friendly, relaxed and welcoming atmosphere while giving everyone the choice to join in an activity or just to chat with friends." Our vocational opportunities offer unique and personalised services which are based on the choices, needs and aspirations of each individual. We offer meaningful training opportunities and the chance to develop work skills in a safe environment. Learning valuable practical skills within this setting can enhance an individual’s self-esteem as they can see firsthand the value in the work they carry out. Scottish Autism’s mission statement, ‘to enable people living with autism in Scotland through the whole life journey’, reflects the understanding that the lifespan of any individual is complex and involves periods of transition and change. At 16, Ewan joined New Ridgepark, our specialist assessment and transition service. After developing independent living skills and accessing local voluntary work opportunities, Ewan moved to his own supported accommodation and started work within our nearby vocational service, Cafe Kudos - gaining a variety of skills and qualifications. Ewan spoke to Kate Leavy, our Autism Practice Improvement Advisor, about his experience of Scottish Autism services and his thoughts for the future. K: What has changed since you have started at Scottish Autism? E: I live in my own house independently...I have had loads of keyworkers in my life I did as well. They have been good, not too bad to work with. They have been excellent and they help me out, and if I have any problems I can talk about them. K: What kind of support do you get from Scottish Autism? E: We have got my keyworker - we work with her most days of the week we do, she looks after me. She makes my dinner, does my paperwork and check I am ok in general and hear all my news. I make them a cup of tea or coffee and then I give handover to staff at nightshift and I say bye Ewan I will see you tomorrow. K: Do you have any goals or reviews? E: Yeah I have reviews every six months I do. I have my keyworker, Louise is the Service Manager and Gaynor is the Senior Autism Practitioner. We talk; Ailie brings a point she does about this and that, if there any changes for Ewan, or if Ewan has any problems. When I want to do something it gets discussed. K: Do you feel ready for a new change? E: I do, cause I am getting older I am too , getting older it is time to move on to get a new job somewhere else...Get a new job in the future somewhere. It was my own idea...I just fancy a change, see what else I could do. I will still work in the cafe for now, cause at times it is hard to get a job. And the other thing I want to do is horse riding. The choice I made I would like to work in a corner shop or another choice was a cafe. They are the places I thought of and chose. Our charity’s vision statement is, ‘A world where everyone with autism can lead meaningful and fulfilling lives and be recognised as valued members of the community.’ Our practitioners enable people in our services to take up opportunities where their skills and talents are showcased or where they can be involved in a wider community project. Scott Smith is a talented artist who accesses our housing support service in Glasgow. He also regularly attends the Aspire Studios at Project Ability in Glasgow where he can access creative activities and learning opportunities. His style of artwork is a varied practice of painting and drawing from life and memory. A body of his work, made over a few months in a flurry of focus and productivity, was displayed in an art exhibition in Glasgow in November. The theme of Scott’s work was birds, and they varied from the beautiful to the comical. Simply and elegantly portrayed, each one has its own charm and character. Outreach support can be provided to access social and leisure activities or liaise with other agencies in relation to training, employment and social welfare support. In outreach support the underlying focus is on enabling individuals to achieve goals which are meaningful to them. Mark, who is supported in our outreach service in Kirkcaldy, indicated to his support team that he would like to visit New York again; Mark had visited the Big Apple in 2014 with support staff and returned with fond memories of the experience. For the last four years, Mark’s health has gradually deteriorated and he is now on the Dementia Care Pathway at the young age of 43 so it was important to organise the trip for the near future. Careful planning and organising was essential to ensuring the holiday would go as smoothly as possible. After booking the trip, Mark’s support staff contacted the airport and organised Airport Assistance – this allowed Mark to get through the check-in and security easily without having to wait in long queues with lots of noise. It also gave Mark an opportunity to visit the airport before the holiday and get a feel of what to expect on the day of his journey. The short break in New York was a whirlwind of activities that Mark had specifically chosen to do. This included a trip on a horse and carriage around Central Park- something he hadn’t managed to do on his previous trip - two Broadway shows, a trip to the natural history museum, and a bird’s eye view of NYC at night from the Top of the Rock Observatory, Finally, no trip to New York would be complete without the obligatory shopping experience. New York itself is a very busy and loud city which could be challenging for anyone but even more so for someone with autism. This came with challenges for Mark and for his support team to ensure that Mark would have the best holiday possible with the least amount of anxieties. By working as a team they managed to achieve a holiday with great memories for Mark to look back on. New Struan School is a Day and Residential School for young people with autism. Here we provide the best possible education and continue to lead the way in our approach and understanding of how young people with autism learn and develop. Enabling individuals to learn new skills and develop their interests is an important part of building confidence and identity. Last November an opportunity arose for pupils when Digital Eagles, Lulu and Anna from Barclays Bank visited the school to teach them about coding. Lulu and Anna go round schools on a voluntary basis teaching staff and pupils about coding. They started off showing two teachers how to use the free coding application on Barclay’s own website. This involved using computer instructions to manipulate and instruct characters on screen, in order to change the music, the size of the animations and how fast they move. After they had familiarised themselves with coding, a workshop was set up with four eager pupils. The pupils very quickly picked up how to code, helped by the fact that they could practise coding in relation to Minecraft, an interest shared by a number of pupils. Two pupils, Jack and Jason, continued to work on their coding skills and used these skills as the basis of their Dynamic Youth Awards. Jack created a video game called Mustia (an anagram of autism) where the two main characters have telekinesis powers. Jason started to learn programming for his award and has recently been getting to grips with HTML and CSS coding. Jason chose this because he thought it would give him good skills for the future. Our Respite and Short Breaks Service at Clannalba offers a safe and homely environment where children and young adults can come to learn and have fun, providing a positive experience for both the individual and their family. Taking part in regular activity or simply moving more often can bring many physical and mental health benefits. As such this is something that our staff teams promote in all our services. In particular, at Clannalba, our Respite and Short Breaks Service, there has been a big focus on this. Something as easy as going for a walk or changing the way we approach everyday activities can make all the difference when it comes to people enjoying a better quality of life. A new outdoor gym at Clannalba has proven to be a great success at inspiring individuals to engage in outdoor physical activities - providing a fun way for those accessing the service to get fit. The local countryside around Clannalba also provides lots of opportunities for exploring our natural environment. Staff have been encouraging exercise by organising outings to explore the local forests and look for different plants and learn about trees. When the weather has been against them, they have provided opportunities within the playbarn to engage in ball games, parachute games, trampets and swimming. Keeping fit and active is an area that Clannalba will continue to focus on over the coming summer by offering a range of physical activity opportunities both outdoors and in. Scottish Autism provides an intensive and effective model for transition based at two of our residential services: New Ridgepark in Lanark and Clannalba near Biggar. It is here that we can offer individuals a sustained period of assessment and support in order to build a greater understanding of their autism and its impact on their life and, crucially, their future support needs. ASDAN’s (Award Scheme Development and Accreditation Network) ‘Preparing for Adulthood’ further education programme, was introduced to New Ridgepark by the service’s APIF (Autism Practice Improvement) group. As part of the framework assessment process, the group identified the need for more formal recognition of achievements made by those accessing our service. The service registered as an ASDAN centre in August 2016 and gradually rolled out the programme focusing on the ‘Towards Independence’ modules as the most appropriate for the age group and abilities of those supported at New Ridgepark. Four individuals are currently participating in the initiative working through independent living, numeracy skills, horticulture and residential experience modules with one of these individuals having also passed external moderation and received a certificate for completing the meal preparation units. The programmes compliment individual support plans, mirroring a lot of tasks/ activities that people already participate in, allowing for recognition and achievement of the skills they already have as well as providing scope to introduce new interests that may not have been considered otherwise. The ASDAN centre co-ordinator within New Ridgepark has recently began working with other services across Scottish Autism to introduce these programmes within their units. Donald took great pride in completing his ‘starting out module’ and has recently finished his ‘Introduction to Meal Preparation and Cooking’ preparing for his next step in transitioning to his own home. Donald is now working on his ‘Employment Module’ assessing his own skill and abilities in Cafe Kudos, where he works. We would like to say a big thank you to our valued supporters who get involved and raise funds for Scottish Autism. Generous donations and fundraising activities help us to reach and support more individuals and families living with autism in Scotland. Donations fund our charitable activities, including our Advice Line which receives over 1900 enquiries per year and Right Click, our online support programme, which has supported over 1400 families since it launched. Fundraising also helps us to provide additional services for those accessing our services such as art therapy, communication aids, outdoor gyms, sensory rooms and social groups. The Fundraising Team raised funds to provide rebound therapy for the pupils at New Struan School. Rebound therapy is a form of exercise that uses trampolines to encourage therapeutic movement in people with a variety of disabilities and additional needs. It gives pupils the opportunity to work on physical, social and sensory goals in a fun and enjoyable way using a combination of games and exercises. The benefits of these sessions for pupils include improved fitness, concentration, balance, and communication skills, as well as increasing muscle tone and promoting relaxation. We are now in the third year of the five year funding from the Big Lottery for our Get Set 4 Autism project. In partnership with Autism Argyll the project aims to provide post-diagnostic support to parents and carers of children and young people up to the age of 18 years old who have autism across Argyll and Bute. The project will promote a greater understanding of autism, improve communication between parents and professionals and ultimately equip parents with the information and practical skills they need to enable them to better support their child. A special thank you to Lyreco for the three year funding to sustain and develop our Right Click programme, which has allowed us to continue providing valuable online support to families when they need it most. We are very grateful for donations from gifts in wills to support and develop our services for individuals and families living with autism. Thank you to all the volunteers across Scotland who get involved and raise money for Scottish Autism. A number of companies also generously donate their employees’ time to help us make improvements in our services which has a great impact on the work that we do across Scotland. Thank you to the staff at Diageo, Network Rail, Ambius, RBS, G4S, Mitie Client Services, Nuffield Health, Baxter Storey and Willerby Landscaping for their time to help upgrade the outside areas in our services. A total of £185,783 was donated by Trusts and Foundations to help us support individuals with autism. Sensory rooms, building refurbishments, social groups and many more activities and enhancements have all been funded and we are extremely grateful for their support and generosity. Fundraising income will continue to support our Advice Line and the development of our Right Click programmes over the next year. These vital services would not be available without donations from funders and generous supporters. Our Fundraising Team is currently fundraising for a new residential service for adults with autism which will open in Alloa in 2018. The new service, named Founders House, will provide accommodation for up to nine autistic adults and include six self-contained flats, all with en-suite facilities. As the individuals we support get older, their needs change over time and additional health and mobility issues add new challenges. We aim for ‘Founders House’ to meet these specific care needs. We need to raise £200,000 to purchase furnishings and fittings and provide upgrades to the property. Established in 2014, our Centre for Practice Innovation drives our knowledge management and practice based research efforts to deliver developments in our practice and to inform the autism knowledge base, specifically in relation to practice and service provision in the wider national and international community. We are seeking the support of a sponsor who feels as passionately as we do about the rights of autistic individuals to a meaningful and fulfilling life and to have their needs met within services where they are understood. At the heart of our financial strategy is a continued focus on growth in our core business, building on our reputation for high quality services. Total income grew by 6% to £26.6m in 2016/17 from £25.1m in 2015/16, and fees for educational and care services grew by more than 8% from £23.7m to £25.6m, with increases both within Autism Services and New Struan School. However, total expenditure, including actuarial pension charges, increased by 6.9% from £26.0m in 2015/16 to £27.8m to 2016/17. Included within these figures was expenditure committed by the Directors from reserves for the “Fit for the Journey” programme of process and systems transformation, reflecting the policy to invest appropriately from reserves into the long-term sustainability of the charity’s operations. 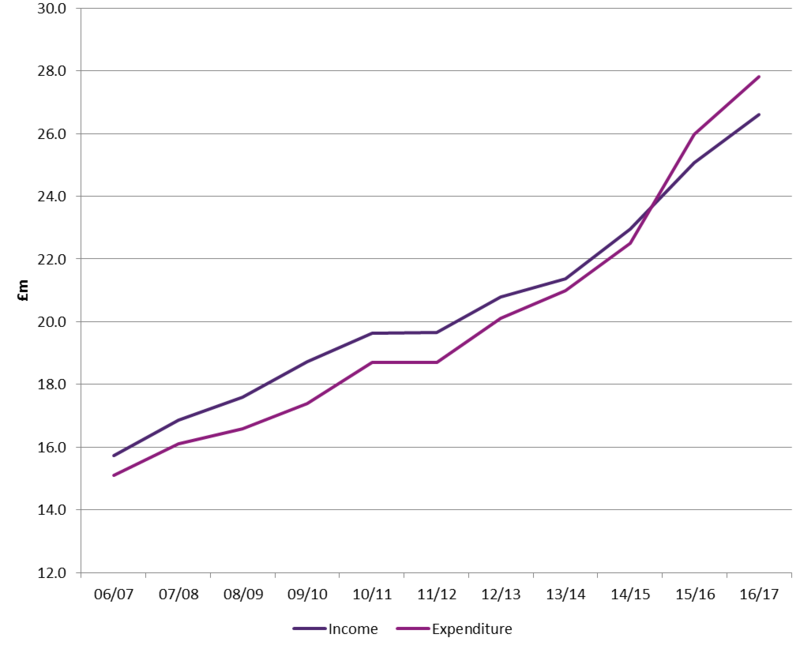 We continue to face the ongoing financial challenges of the freeze on local authority funding and changes in employment legislation, and the gap between total income and total expenditure widened slightly during the year. The underlying balance sheet position remains strong, with net current assets of £7.7m (2016: £7.9m), but a large upswing in the value of our defined benefit pension deficit has led to an overall net liability position at the year end. We anticipate that the reform of our pension provision, with new starters now being offered access to a defined contribution scheme, will help us return to a stronger position over time. We will also look to increase our fundraising income and look closely at every pound we spend, to make sure we are as cost effective as we can be in delivering high quality services to individuals with autism. In 2017/18 we plan to develop our Values into Practice model by establishing a VIP Academy. This will host a range of online resources to further deepen staff’s theoretical and practical understanding of autism. We will also continue to harvest the experience and knowledge that resides within Scottish Autism to create knowledge assets for wider dissemination in order to promote the best care and support for autistic people. As we progress with our programme of enterprise architecture, 'Fit for the Journey', we will start to implement an entirely new IT system. This will integrate departments and services across Scottish Autism, yielding further gains in productivity and improvement of our business processes. Despite our sustained efforts to become more efficient, the financial stress on our organisation caused by the ongoing squeeze on local authority funding cannot be ignored. Thus it is important to recognise that it is thanks to the generosity of trusts and foundations, as well as our dedicated fundraisers, that we can continue to offer and develop our family and professional initiatives as well as our practice research work and support our core service delivery. We hope that this review gives you an insight into the achievements of the autistic people we support and the ethos that underpins our organisation. As always, quality will continue to be at the heart of our service delivery and we look forward to evidencing this further through the EFQM Recognised for Excellence Award.